Salivary gland, Parotid - Basophilic hypertrophic focus in a female F344/N rat from a chronic study. 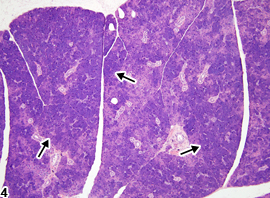 A focus of hypertrophied cells with increased basophilia is present (arrow). 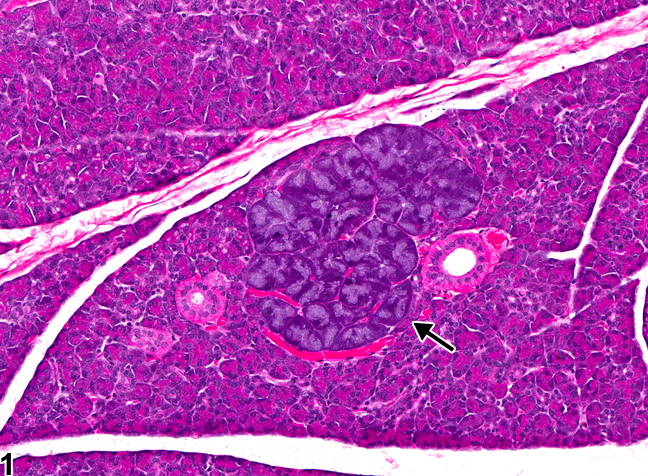 Salivary gland, Parotid - Basophilic hypertrophic focus in a female F344/N rat from a chronic study (higher magnification of Figure 1). 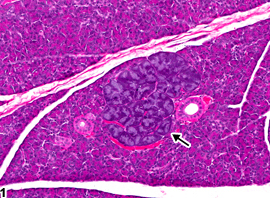 A focus of hypertrophied cells with increased basophilia is present (arrow). Salivary gland, Parotid - Basophilic hypertrophic focus in a male F344/N rat from a chronic study. 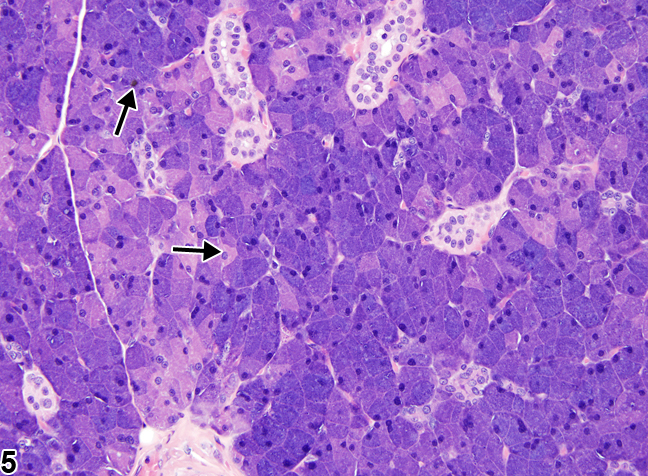 Multiple foci of hypertrophied cells with increased basophilia are present (arrows). Salivary gland, Parotid - Basophilic hypertrophic focus in a female F344/N rat from a chronic study. Multiple foci of hypertrophied cells with increased basophilia are present (arrows). 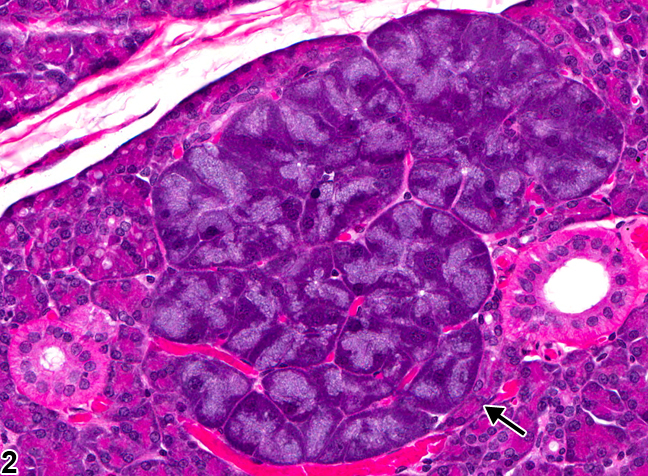 Salivary gland, Parotid - Basophilic hypertrophic focus in a male F344/N rat from a subchronic study (higher magnification of Figure 4). Multiple foci of hypertrophied cells with increased basophilia are present (arrows). 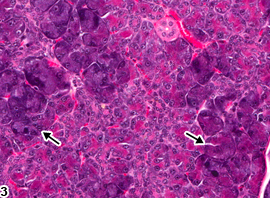 Basophilic hypertrophic foci of the salivary glands have been found only in the parotid gland in mice and rats and usually occur singly ( Figure 1 and Figure 2 ), although multiple foci may be observed ( Figure 3 , Figure 4 , and Figure 5 ). The foci consist of focal clusters of enlarged acinar cells that contain increased amounts of cytoplasm and, sometimes, enlarged nuclei. The apical cytoplasm is usually vacuolated and pale, while the basilar cytoplasm is deeply basophilic. This change may be seen occasionally in untreated rats, but chemicals, including doxylamine, have produced this change in the parotid gland of F344 rats. This change is not thought to be preneoplastic. When a single focus is present, it should be diagnosed as "basophilic hypertrophic focus." Multiple foci should be diagnosed as "basophilic hypertrophic focus, multiple." Severity grading is not necessary, but if an increase in size or number of foci is correlated with chemical exposure, a grading scale should be applied that takes into account both the size and number of foci in each animal.